It's never too late for a new beginning. Look closely and you'll see that theme all through the Bible. Page after page, God delights in turning tragic endings into new beginnings. A childless woman conceives in her old age; a fearful, self-conscious shepherd becomes a leader of millions; and a prostitute becomes a wife and mother in the lineage of Christ. Every biblical fresh start reveals the amazing, awe-inspiring hope we have for our own new beginnings in God's plan for our lives. Joyce Meyer is one of the world's leading practical Bible teachers. A New York Times bestselling author, Joyce's books have helped millions of people find hope and restoration through Jesus Christ. Through Joyce Meyer Ministries, Joyce teaches on a number of topics with a particular focus on how the Word of God applies to our everyday lives. Her candid communication style allows her to share openly and practically about her experiences so others can apply what she has learned to their lives. 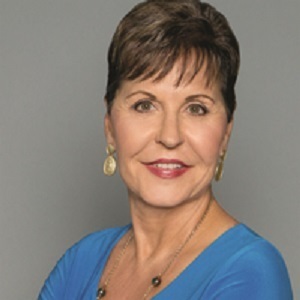 Joyce's programs, Enjoying Everyday Life and Everyday Answers with Joyce Meyer, can be seen around the world through television, radio, and the Internet. Joyce has authored more than 100 books, which have been translated into more than 100 languages and over 65 million of her books have been distributed worldwide. She teaches in cities across America as well as internationally. Joyce Meyer Ministries has offices in nine countries. Joyce's passion to help hurting people is foundational to the vision of Hand of Hope, the missions arm of Joyce Meyer Ministries. Hand of Hope provides worldwide humanitarian outreaches such as feeding programs, medical care, orphanages, disaster response, human trafficking intervention and rehabilitation, and much more - always sharing the love and Gospel of Christ.